Kids are all about the trick-or-treating Halloween night, but we’re playing a trick on them – by healthy treats. Here’s a list of healthy treats that still keep up with a fun Halloween theme. Don't point fingers at the kids for grabbing a sweet treat, instead make up these bony witch’s fingers. This cheese and pepper snack from A Little Lunch, makes a scary Halloween appetizer by pairing roasted red pepper dip as blood. Another healthy recipe for the “ultimate cool kid” lunch or that Halloween party are these Pepper Jack-o-Lantern Vegetable cups. Cut faces into peppers, fill one with dip, and fill the others with your favorite, veggies - cucumbers, tomatoes, the works, Here's a video, with a step by step guide. For more jack-o-lantern love why don't you stuff them with taco meat and veggies. Stuffed pepper jack-o-lanterns are AMAZING and spookily festive. We've covered witches & pumpkins, but what about spooky Halloween skulls? We love avocados and cucumbers hence why we suggest you try these Real Simple, skull cucumber pickles to add some veg to Halloween night or this Holy Skull-y Guacamole? You could also make a frankenguac or a skeleton-shaped veggie tray. If you love the guac? These devilishly delish Avocado Sriracha Deviled Eggs are healthy, festive, and fun with a kick. Perfect as an app or packed in a lunch, they are sure to bite. Or for a little more bite, try this Pulled Pork with “vampire blood”. 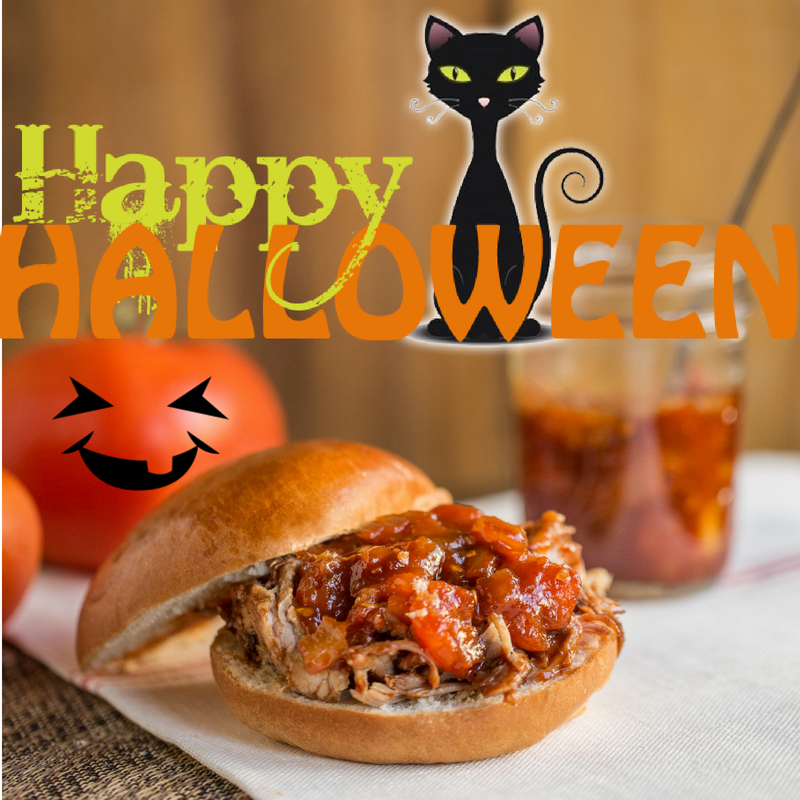 Our pulled pork tomato chutney is great, we just added a few extra fresh chopped tomatoes of our favorite variety to mimic oozing blood. Here’s an idea! Use our spicy tomato blaster smoothie as a vampire drink to quench your thirst this Halloween night. As far as holidays go, Halloween is at the top of the list for fun themed food and parties. But we are always looking for new ways to expand our recipe and our fun lunches for our kids. Have a fun festive recipe? Share it with us!